A group of penguins is called a waddle of penguins. Yes, a waddle. Unless they’re in a nesting group, that’s a rookery. Or a group of penguin babies, that’s a creche. Or, if it’s a group on water, that’s a raft. Animal group names are so much fun, who doesn’t like a gaggle of geese for instance. Isn’t it cool that fish go to school? The names I’ve chosen lend themselves easily to differentiation. Some students need to think about “a tower of giraffes” while others are ready to understand “a pandemonium of parrots” or “an exaltation of larks”. Oh, and it is actually a congregation of alligators. Diane has won the Penguin Products or any $25.00 of items from my store. I’ll let you know her choices! Here’s a Fun Linky party. Linda at Primary Inspiration has a linky with free classroom decor printables. Go find some ggod stuff, or maybe even add your own link. Sorry, I found more appropriate example quotes, but I love Mark Twain. Example and Non-example is a great way to build concepts that provide students a deeper understanding of the vocabulary terms they are learning. Then you need several good non-examples. 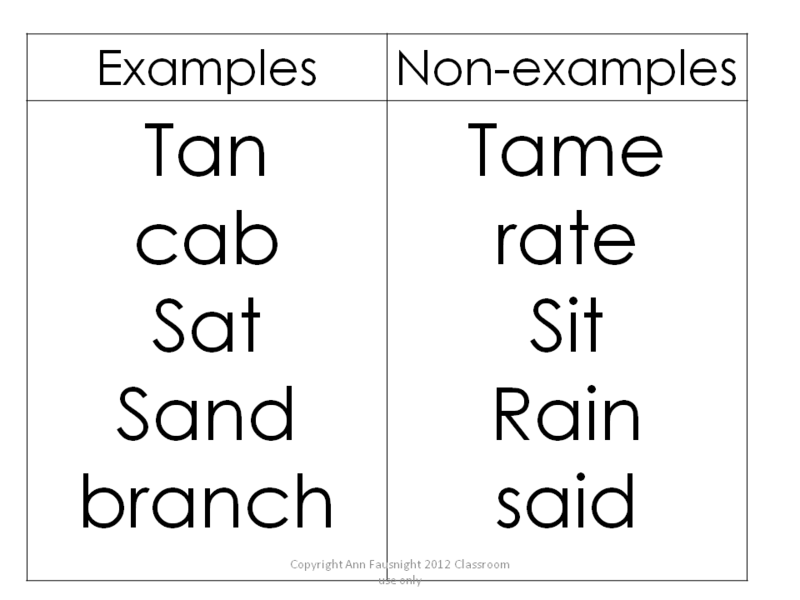 The non-examples should have at least one of the characteristics of the example. They should not be something completely off target, like “fire.” For things that are not polygons, we would present a figure without straight sides such as a circle or oval, a 3-dimensional object such as a cube, and a figure with all straights sides that isn’t closed. To begin, one object is presented and placed on one side of the display area (example). A second object is presented and placed on the same side. Students are then asked to determine what is alike about these objects. A third object is presented and placed on the other side (non-example) of the display. Students are given the opportunity to discuss why it doesn’t belong with the others. Continue in this way with several more objects until the students feel certain they know how the objects are being sorted. Ask for their explanations. Allow students to determine the place for the remaining objects and/or allow students to suggest additional objects for the example side. At the end of this particular activity, we will create a definition of polygons based on the ideas the students have brought forth themselves. Finding their own understanding is an important element in retaining the lesson. This activity can be done with very simple concepts. You could do lowercase letters, not lowercase letters (use some capital letters and a number for non-examples) or short-a words, not short-a words (use some long-a words or other short-vowel words for the non-examples). It can also be used with very complex concepts. Older students could be given a chart of examples and non-examples and be asked to determine how they were sorted, on their own or with a partner. Conversation is a very important learning tool! Students can even be given a list of objects to sort themselves and be asked to write their rationale for sorting them into two categories. Check out this article with a great description of this strategy. Find more vocabulary development ideas at my TPT store.